State House officials say he was treated in a cardiac unit after feeling 'discomfort,' but few other details are made public. AUGUSTA — Gov. Paul LePage was back in the Blaine House on Monday after being hospitalized over the weekend, but the details of his illness or injuries were not disclosed to the public. In a short statement Monday, Peter Steele, LePage’s communications director, said LePage had been discharged from Eastern Maine Medical Center in Bangor and was back at the governor’s residence in Augusta. “Governor LePage is back in the Blaine House today, resting and getting ready to return to work in the next couple of days. He and his family thank everyone for their concerns and well wishes,” Steele wrote in an email to the media. In a statement Sunday, LePage’s office said only that the governor had been transferred Saturday from a hospital in New Brunswick to Eastern Maine Medical Center in Bangor because he was experiencing “discomfort.” The weekend statement did not include any details about the governor’s discomfort or condition, and Steele offered no additional information Monday. James Cyr, the communications director for Republican state Senate President Michael Thibodeau, said Monday that Thibodeau’s office was advised that LePage had been hospitalized on Saturday. Under Maine’s Constitution, the Senate president becomes acting governor if the governor dies in office or is incapacitated and unable to perform his duties. Cyr said the notice Saturday was unusual because LePage’s staff had not contacted Thibodeau’s office when LePage was previously hospitalized for brief periods. Steele, in his statement Sunday, said LePage was transported from a hospital in New Brunswick to Presque Isle and then taken to EMMC, arriving about 11:30 p.m. Saturday. Other State House officials, who spoke on background, said LePage was being treated at the Bangor hospital’s cardiac unit. The hospital has a special unit that focuses on cardiac patients. Since being elected in 2010, the 69-year-old Republican governor has experienced at least two significant challenges to his health that have been made public. Despite being one of the state’s most prominent public officials, LePage in both instances agreed to disclose details only several months later. 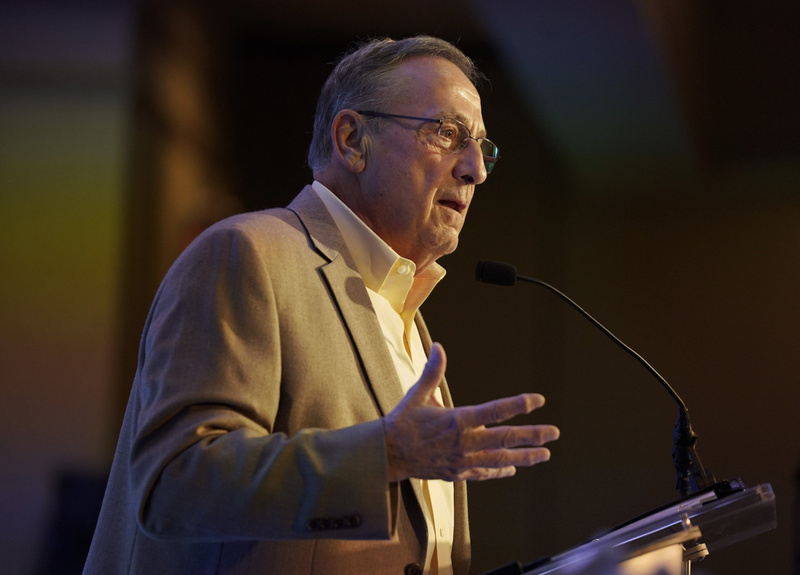 In January 2017, LePage told a radio talk show host that his dramatic weight loss was the result of bariatric surgery that he underwent in September 2016 at Central Maine Medical Center in Lewiston. At the time, LePage’s staff expressed reluctance in talking about the governor’s health. In a radio interview, LePage said he decided to undergo the procedure after the doctor told him he risked developing diabetes if he did not lose weight. He said he was struck by a young woman after she cut him off while making a turn. The crash exacerbated a shoulder injury and required surgery. In the weeks after, LePage was frequently seen wearing a sling to support his arm on the injured shoulder. “Without a helmet, I wouldn’t be here,” the governor said. Lawmakers on Monday expressed wishes for a speedy recovery for LePage, but some took the opportunity to note the governor’s opposition to expanding Medicaid coverage based on a ballot question passed by voters last November. LePage’s top political adviser, Brent Littlefield, said Monday he wasn’t authorized to discuss any details of LePage’s health or what caused him to be hospitalized Saturday night.